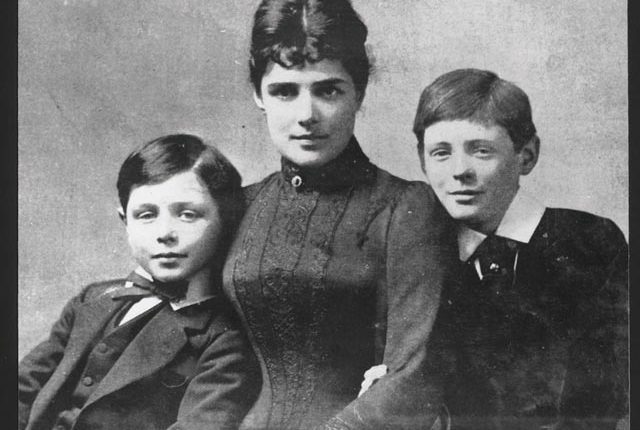 Above: Lady Randolph with her sons Jack (left) and Winston, mid-1880s. Winston Churchill put this question to his mother Jennie1 in a postscript to a letter he wrote her in 1901. Twenty-five-years old, he had just finished reading An English Woman’s Love Letters, in which the young heroine’s mother stifles her daughter’s first love affair.2 At the time, Winston and Pamela Plowden had just broken off their relationship. 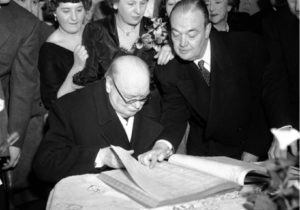 History does not reveal whether Winston felt his mother had obstructed his wooing of Pamela, or whether he was referring obliquely to Jennie’s new mother-in-law, Patsy Cornwallis-West. Patsy had opposed the relationship between her son George and Jennie because Jennie was almost twice George’s age. Whatever prompted the light-hearted postscript to Winston’s letter, he must have known that Jennie was an unusual mother by British standards. Five biographers have tackled her life. Each attested to her abilities as a musician, linguist, writer, playwright, magazine publisher, political hostess, election campaigner, interior designer and fund-raiser. Yet there has been surprisingly little focus on how she shaped her son’s outlook in the first twenty-five years of his life. In the second half of those years, she was effectively a single parent. Winston himself may be responsible, because he wrote in his autobiography, My Early Life, that he loved his mother “dearly but at a distance.”3 His verdict is too readily adopted by many Churchill historians. Closer reading of My Early Life reveals that the “distance” did not last beyond his father’s death in January 1895. Thereafter, Winston writes, Jennie became an “ardent ally, furthering my plans and guarding my interests with all her influence and boundless energy.” Their relationship, he claims, was “more like brother and sister than mother and son. At least so it seemed to me.”4 How close were mother and son and how typical was this of their time? When Winston was born in 1874, the social elites of Britain and America took a different approach to parenthood. America’s founding fathers had deliberately established a less patriarchal society than the one they left behind. There was no place in their laws for primogeniture or male entail, the twin pillars of the English aristocratic system. Such inheritance laws as existed in the American states treated sons and daughters alike. Rapid economic growth required children to help their parents as soon as they could, and gave parents reasons to encourage initiative in their offspring. Relationships between parents and children were more relaxed in America than in Britain, and mothers played a more influential role in bringing up their sons. In 1874 Britain, by contrast, fathers not mothers were still legally responsible for a child’s welfare. The received wisdom amongst Victorian parents was that their children started life as “defective adults” and needed to acquire rules of behaviour to iron out their imperfections. Wealthier English parents delegated offspring training to a “nanny” who administered in a nursery, usually on the top floor of the house. From here the children descended once a day to meet their parents. For sons, there followed a secondary phase of training when they were despatched at the age of eight to a “preparatory” school. There they would spend eight months a year away from home. Thus liberated from the daily concerns of childcare, British mothers could support their husbands in the busy round of social entertaining that went hand in hand with public life for the leaders of Victorian Britain. The American-born Jennie veered backwards and forwards between these two contrasting approaches to parenthood. After a childhood in New York, Trieste and Paris, she had found herself catapulted at the age of twenty into the British aristocracy. She was excited by the political ambitions of her husband, Lord Randolph Churchill, younger son of the 7th Duke of Marlborough. So when their first child, Winston, arrived within months of her joining this new caste, she readily adopted its habit of employing a nanny, “Mrs.” Everest, to look after the child. Nonetheless, Jennie acquiesced later that year to the British custom of sending her son to boarding school as soon as he was eight years old. It is in the decade that follows, while Winston attended three boarding schools, that Jennie is most vulnerable to the often-made charge of neglecting her son. She wrote regularly, but seldom visited him at the schools despite his entreaties to do so. The demands of her husband’s political career can only explain the first five years, because Lord Randolph suddenly resigned from the cabinet at the close of 1886 and never regained ministerial office. Thereafter his health declined rapidly. As Winston entered his teenage years, Lord Randolph became a shadow of his former self, often absent on long trips abroad, just when his son needed a strong father figure. Jennie was caught between the two and found Winston difficult to manage on her own. She left much of the task to his school and his nanny, while she carved out her own distinctive social life. There was no shortage of male suitors willing to fill the gap left in Jennie’s life by Lord Randolph’s long absences. Faced with a choice between escorting Winston to the dentist to have a tooth extracted, or a day at the races with a party of friends, Jennie usually chose the latter. When Lord Randolph died three months later, the new closeness between mother and son entrenched itself. It could not have done so unless Jennie had laid strong foundations of maternal love before Winston’s school years. The relationship between mother and son was at its closest during the five years between 1895-1900. It is best seen through the weekly letters they exchanged while Winston served with his cavalry regiment in India. It was Jennie who arranged with the owner of the Daily Telegraph for Winston to write despatches about the fighting for the newspaper. She also found a literary agent to sell Winston’s first book about the campaign to a publisher. It was she again who acted as the publicist for The Story of the Malakand Field Force with her many friends in the press, politics and armed forces when the book was published early in 1898. It was Jennie who lobbied the prime minister, Lord Salisbury, and the Army commander-in-chief, Sir Herbert Kitchener, for Winston’s transfer from India to the Egyptian army in Sudan. She also arranged for his first political meetings in Bradford and London on his spells home on leave from India. Mr. Lough is editor of My Darling Winston: The Letters of Winston Churchill and His Mother (2018) and author of No More Champagne: Churchill and His Money (2015). 1 Born Jennie Jerome in Brooklyn, 9 January 1854, she became known as Lady Randolph Churchill on marriage in 1874; then as Mrs. George Cornwallis-West on remarriage in 1900; and finally once again as Lady Randolph Churchill on the dissolution of her second marriage in 1914. 2 The book’s author was later revealed to have been a man, Laurence Housman, rather than a woman. 3 Winston Churchill My Early Life (London: Thornton Butterworth, 1930), 5. 5 Peregrine Churchill and Julian Mitchell, Jennie, Lady Randolph Churchill (London: Collins, 1974), 108-09. 6 WSC to Jennie (JSC), 2 November 1894, Churchill Archives Centre (CAC), CHAR 28/20/45-46. 7 JSC to WSC, 24 December, CAC, CHAR 1/8/81–82. 8 JSC to WSC, 26 February 1897, CAC, CHAR 1/8/91–93. 9 JSC to WSC, 4 November 1897, CAC, CHAR 1/8/115–16. 10 WSC to JSC, 16 May 1898, CAC, CHAR 28/25/6–8. 12 WSC to JSC, 14 February 1901, CAC, CHAR 28/26/94. 13 WSC letter to JSC, 13 December 1901, CAC, CHAR 28/26/103. 14 JSC to Jack Churchill, March 1914, cited in John and Celia Lee, Winston & Jack (self-published, 2007), 245. 15 JSC to WSC, 27 November 1915, CAC, CHAR 28/120/1-2. 16 JSC to WSC, 3 February 1916, CAC, WCHL 14/1/28-30. 17 WSC to Lady Islington, 1 July 1921, The Churchill Documents, Vol. 10, 1532.